USS Panay (PR-5) sinks after being bombed and strafed by Imperial Japanese Navy aircraft. She is down by the bows after a near miss opened her hull plates. In this view, you can see her smashed pilot house, hit by a direct bomb. 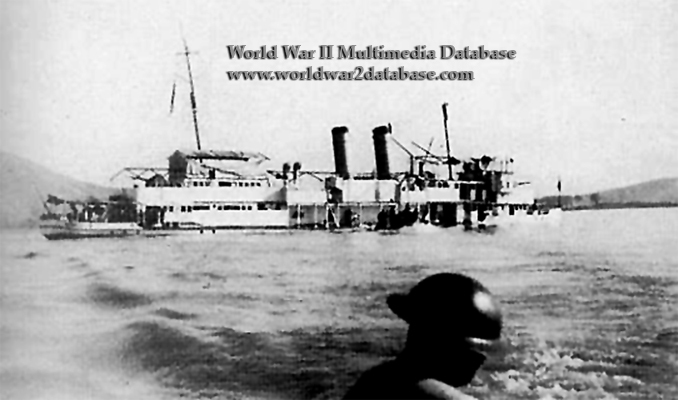 This view, taken from a film by Universal Newsreels' Norman Alley or Fox Movietone News's Eric Mayell, the two cameramen aboard USS Panay, shows one of Panay's two lifeboats removing the last survivors to shore as Panay sinks. "Norman Alley's Bombing of the U.S.S. Panay" was released in theaters in January 1938, after the footage was brought at great expense in secrecy to the United States. Their film clearly showed the Japanese excuses for the attack - that it wasn't deliberate, it was a case of mistaken identity from a high level attack, there were no American flags identifying the ship and it was a cloudy day - were all wrong. The sun was shining, the Japanese Navy planes came in at less than 3,000 feet, and a huge six by eleven-foot flag, one of three national ensigns marking the ship, are clearly seen in the newsreel footage. Roosevelt ordered the newsreel edited so that the low-level attacks were removed to not inflame public opinion again. Because the Japanese dropped 132-pound (60-kilogram) bombs instead of heavier ordinance, casualties were comparatively light; United States President Franklin D. Roosevelt remarked that if more had died, it would have been difficult to prevent a national outcry for war.